Here, you'll find a combination of small town pace with big city convenience. A cultural hub, Falls Church offers a unique blend of historic places, parks, shopping, music venues, restaurants and employment centers, all within easy access of Washington, DC, and major highways. 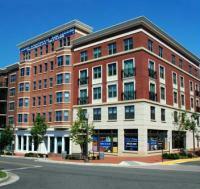 Discover upscale living in Falls Church. Your brand new home offers modern sophistication with condominium-level finishes and amenities unlike any other apartment residence in Falls Church. Pearson Square offers unsurpassed luxury and cutting-edge technology to create a unique living experience. Chic and stylish, your new home features attractive, open living spaces with floor plans and apartment homes to fit your lifestyle. This is Falls Church living as you've never seen before. Distinctive living, only at Pearson Square. Come on home to Falls Church. Directions: From I-66 take Route 7 East towards Falls Church. Turn right onto S. Maple Avenue. Pearson Square is ½ mile down on the right.